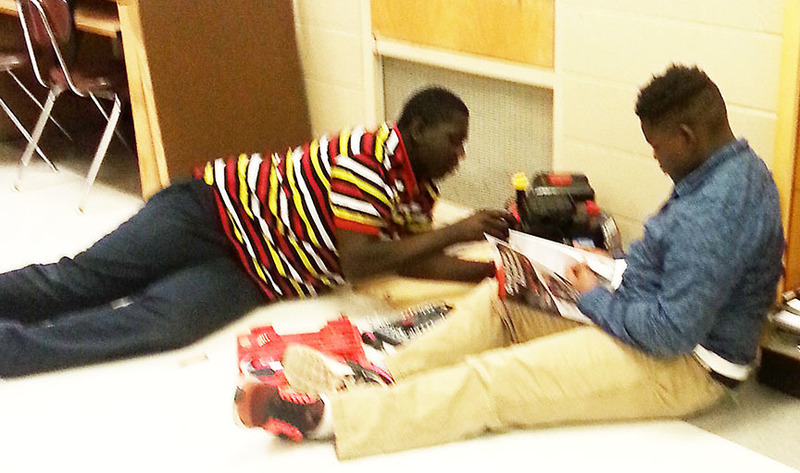 Two Blytheville Middle School students work with the Briggs & Stratton motor, with one examining the teaching manual, during the "Tinkering" makerspace activity that is part of the seven new makerspace stations inside the BPS library. Blytheville Middle School librarian Melisa Rutherford's latest contribution to education provides an opportunity where students can come into her library and explore ideas that could lead them to perhaps becoming an artist, engineer, computer analyst or machinist. This trend, known as makerspaces, allows students to explore, create, or simply have a little fun in the library media center. They could even gain an early start toward an occupation. The BMS library is now home to seven “Makerspace” activity stations, something that Rutherford had been interested in for a few years and finally decided nearly a year ago to transform part of the library to something that is as unlimited as the student’s imagination. “This is what a learning center is meant to be,” said Rutherford, the school’s media specialist. Rutherford was introduced to makerspace activities two years ago at a library conference, and talked to BMS students last spring about possibly setting up some of them. To finance the program she used book fair funds, provided yard sales and had a number of items given to her. She also applied for, and ultimately received, for one of the activities a brand-new Briggs and Stratton engine, 10 teaching manuals and a CD about basic engine systems. The makerspace stations include Creative Crafting, Collective Crafting, Technology Inspirations, Technology Engineering, Strategic Lines, Tinkering and Engineering Innovations. “Creative Crafting” features art supplies and allows students to design, create and explore through art. Art projects created at this station are the student's artwork, and they may choose to keep their creations. The station for “Collective Crafting” features art projects that are for the library or school, with the projects or kits the property of the library. “Strategic Lines” involves board games that also includes chess, checkers and card games. The “Engineering Innovations” station allows students to build, design or create three-dimensional objects. “Technology Inspirations” features technology application software and instruction to interact appropriately with technology but also to innovate and problem solve. “Technology Engineering” allows students to work with machines and circuits. And thanks to a special program from Briggs and Stratton, “Tinkering” gives students a 4-cycle engine that they can take apart and put back together. Rutherford added that more makerspaces will be added through time and interest. Makerspaces are available before school, during lunch and after school, and during the day a teacher may send a student with a pass for a specific time period.